Jesus must be first in our lives. There is no other way that life works. Jesus must be first. Only when He is first, does everything else fall into place. We see in today’s text that different people respond to Jesus’ call to follow Him. One says, I’ll follow, but Jesus warns, it will be tough. You will have no place to lay your head. Scripture doesn’t say, but it implies that He does not follow. Jesus is saying – I must come first. Next, Jesus gives the call and the other says, I must bury my father. Jesus response sounds cold, uncaring for family. That’s not who Jesus is, through. If you remember at the cross, one of the last things that He did was that He made sure His mother Mary was taken care of. Jesus is not uncaring for family. He is just saying – I must come first. Finally one says let me go and say good by to my friends and family, and Jesus responds – no. I must be first! Jesus does not desire to separate us from those that love us. He does nto desire to separate us from those that we love. What is saying is this – first things first. I must come first. In every relationship, in every moment, in every thought, in everything in our lives, He must come first. That’s where life is found. And when He is first, everything else makes sense. When He is not, when something or someone else is first things don’t make sense. But, when He is first, life is as it should be. 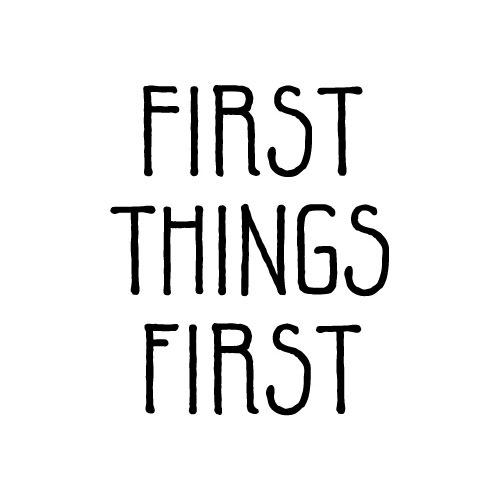 Today, in all your life, keep first things first. Keep Jesus first. And everything else will make sense.